The Hotel Plaza Athénée has re-opened after closing in October 2013 for a massive renovation. The hotel's restaurants, including Alain Ducasse au Plaza Athénée and Le Relais Plaza, are once again serving guests. Alain Ducasse au Plaza Athénée, Hôtel Plaza Athénée 25, av. Montaigne, 75008 Paris, 01 53 67 65 00. Closed for eleven months, Hotel Plaza Athénée and its gastronomic restaurant have reopened. 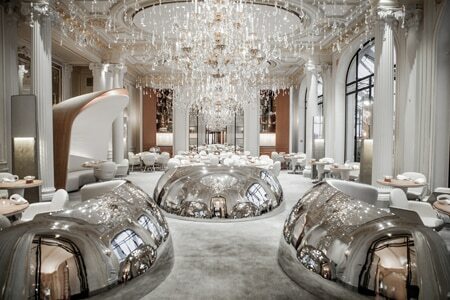 Executive chef Alain Ducasse has bet on “naturalism” to renew the menu served at Alain Ducasse au Plaza Athénée. Sustainable fishing, organic vegetables and cereals are from now on highlighted in the stately dining room. Romain Meder, 35, formerly at La Cour Jardin and at Spoon in Mauritius, is in charge of the cuisine. Décor of the restaurant has been slightly done up, with the addition of huge stainless steel bells housing banquettes and a hull set in upright position to shelter a table. Alain Ducasse au Plaza Athénée, Hôtel Plaza Athénée 25, av. Montaigne, 75008 Paris, 01 53 67 65 00. As it was announced in 2011, the transfer of the restaurant Guy Savoy into the Hotel de la Monnaie in front of the Seine should finally take place by the end of the year. The restaurant will then boast a view of the river and a décor from Jean-Michel Wilmotte. Guy Savoy also plans to open MetaLcafé, a brasserie in the courtyard of the hotel, but within two years. His establishment at 18, rue Troyon will be dedicated to seafood and flanked by an oyster bar. Guy Savoy, 18, rue Troyon, 75017 Paris, 01 43 80 40 61. Chef Anne-Sophie Pic is bringing her Parisian eatery, La Dame de Pic, to New York City. The restaurant will actually be two in one: on the ground floor will be Metcafé, an outpost of her Monaco establishment, and on the second floor will be La Dame de Pic. The chef's eponymous restaurant, Pic, in Valance, France, earned an 18 rating from GAYOT. La Dame de Pic & Metcafé, 510 Madison Ave., 10022 New York, no phone. Antoine Westermann Expanding to New York? Word on the street is that Antoine Westermann, the Parisian master of rotisserie chicken (and owner of Paris' Le Coq Rico), is scouting locations in New York City for a restaurant. Details are scant but if true it will add more evidence that rotisserie chicken is the new pork. Closed for renovation since August 2012, the Ritz Paris hotel is scheduled to reopen in spring 2015. Chef Michel Roth, who helmed L'Espadon, the gastronomic restaurant of the property, has divulged this summer that he won’t be back working at the hotel. L'Espadon, Ritz Paris, 15, place Vendôme, Paris 75001, 01 43 16 30 80. Chef Philippe Labbé has left the Shangri-La Hotel, Paris. For three years, he helmed the gastronomic L’Abeille and supervised the Shang Palace, the Chinese restaurant of the property. The name of his successor hasn’t yet been revealed. As for Labbé, he’s currently seeking a place to express his talent. L'Abeille, Shangri-La Hotel, Paris, 10, av. d'Iéna, Paris 75116, 01 53 67 19 90.